Physicists were all abuzz in February 2016 with a universe-shaking announcement: Scientists had detected the sound of two massive black holes smashing into one another, forming a new black hole nearly twice as big. The sound came in the form of a brief burst of gravitational waves, vibrations that radiated from the collision-like ripples spreading on a pond, traveling more than a billion light-years before they reached Earth. This was the first time in history that anyone had directly detected gravitational waves. The hypersensitive antenna that picked up the sound, a brief chirp that lasted a fraction of a second, is the Laser Interferometer Gravitational-Wave Observatory (LIGO). LIGO is actually two separate antennas, one in Hanford, Washington, the other in Livingston, Louisiana. Each consists of a pair of 2.5-mile tunnels at right angles to each other, down which researchers shoot laser beams and measure their reflections in order to detect tiny movements. Boston University physicist Andrew Cohen talked with university writer Neil Savage in March 2016 and explained what LIGO found and why scientists are so excited. Einstein’s theory of gravity, called general relativity, has been around for about a hundred years and it predicts gravitational waves, which have been seen indirectly in the past but have never been directly detected until now. What’s really exciting about this observation is twofold. First, it’s direct confirmation of the existence of gravitational waves—although I will tell you that no astrophysicist doubted the existence of them, because the theory of general relativity has been so well tested. Although it’s always exciting to see something like this confirmed, it hasn’t changed anybody’s view of anything. What is more exciting is the fact that we can now see an astrophysical event in gravitational waves and study it in a way that we never would have had access to before. Meaning the merger of two black holes. But how do gravitational waves tell us about that? The details of the event—exactly what was happening, the nature of the black holes, how big they were, what the size of the object is once the merger has happened—are all encoded in the details of the gravitational wave they detected. The gravitational wave is not very different from radio waves; they differ in some important details, but generally it’s about the same. When you receive a radio transmission on your car radio, how do you know who the singer is? Well, you can recognize the sounds that are being produced. And in exactly the same way, the black holes, when they merge, produce a characteristic wave signature. The wave has features we can hear in this detector, and by looking at the shape of that wave, we can infer all the details of the event that created it. So how is this different from an antenna or a radio telescope? It’s the same in principle. Radio telescopes and optical telescopes are both seeing electromagnetic radiation, which is produced from the motion of electrically charged particles. You shake electrically charged particles and the waves travel away from the particles that you shook, and then you need a detector to see them. The same is true of gravitational waves. You need to shake a mass so that the gravitational forces associated with that shaking produce the gravitational wave, and then that wave, in turn, will shake another gravitational mass in the antenna for detection. Gravitational waves require very, very strong forces to produce them—at least to produce them enough that we can see them. So that’s why the event that they saw, this merger of black holes, had to be very massive objects with very strong gravitational forces involved, in order to produce the radiation so we could see it. The typical kind of astrophysical event that will produce these are collisions or mergers of very massive gravitating bodies—so, black hole mergers, neutron star mergers, and potentially things that we haven’t even thought of. What might we see with LIGO that we can’t see with other telescopes? Black holes are objects that have been known theoretically for 100 years, and it’s really only in the past 30 or 40 years that we’ve been able to observe them, and the observations are kind of indirect. They’re black, roughly speaking, so they’re hard to see. We infer their existence from the strong gravitational effects on the visible matter that surrounds them. This is now an opportunity to see the gravitational forces directly through the radiation that they produce. So it’s going to open up really tremendous new avenues in our understanding of objects like black holes themselves, and neutron stars, and similar strongly gravitating objects. We don’t even have a good handle on how many black holes are out there. Each of these black holes had a mass that was roughly 30 times the mass of our sun, and they merged into an object about 60 times the mass of the sun. Before this observation, we expected that there could be objects with these masses, but we had no idea how many there were. So that’s one of the things we’re going to learn from this, which is very important for understanding the evolution of the universe. What about dark matter? We can’t see that either, and we don’t know what it is, but it’s supposed to make up about 23 percent of the universe. Dark matter doesn’t appear to be composed of electrically charged objects and so doesn’t emit electromagnetic waves, so we can’t see it with a conventional telescope. But it does experience gravitational forces and in fact, the way we know dark matter is there is by observing its gravitational force on ordinary matter. So, by observing gravitational waves, we’re now seeing objects in ways that are not related to the motion of charged particles, but the motion of all the mass in these objects, so that’s what’s tremendously exciting here. It really is a new window into the universe. Is somebody going to get a Nobel Prize for this? How does this compare to the discovery of the Higgs boson in 2012, the elemental particle that gives all matter its mass? They’re different. The Higgs was the discovery of an object that many of us expected to be there, but wasn’t inevitable. So it really taught us something fundamental about nature that we did not know, although we suspected. 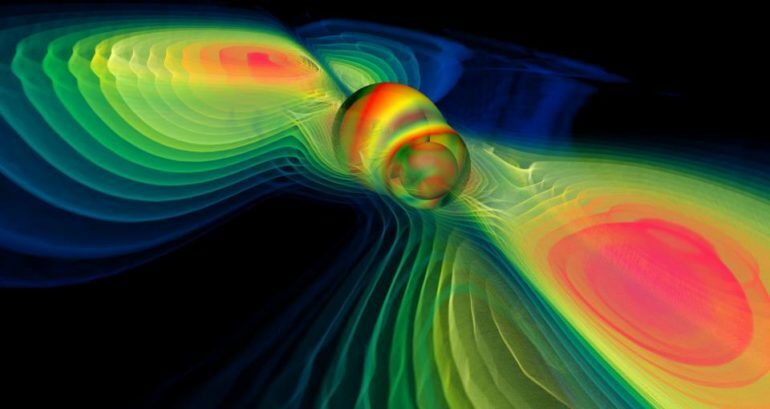 The discovery of gravitational waves—no one doubted their existence. Nevertheless, it’s always nice that you can see them explicitly, as has been done in LIGO. I don’t think it makes any sense to compare the bigness of scientific discoveries. Isn’t it enough for you that physicists will tell you it’s going to win a Nobel Prize? What comes next? People are building even more sensitive gravitational wave instruments, aren’t they? They’re very exciting; but remember, LIGO is continuing to operate—never mind the other instruments. What is especially exciting is that this event was seen in the first month of operation. It’s not at all unlikely that there are other events that the instrument has already seen that will show up when they complete their analysis of the data. The new instruments are being designed to see 10 times more events in a year, maybe events that are outside of the range of sensitivity of LIGO. The more you see, the more you can say. It’s when it’s seen more events that we can really declare the beginning of this new era of gravitational wave astronomy. So you see this as a new era? It’s just like when you first pointed a telescope at the sky. It was an opportunity to observe things in a way that you never were able to before, and all the things you could learn by doing that; so this is a first step in what is likely to be a major, major development in the way we observe the universe around us. We now have a new kind of telescope that we can use to see these interesting events that are taking place in the universe at large.